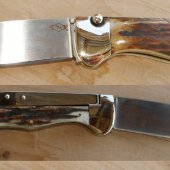 Our repro Knives are just that ,they are as close as I can make them to the original with new material like Stainless Steel for blades ,liners, and Bolsters as well as exotics like Ivory and Stag. 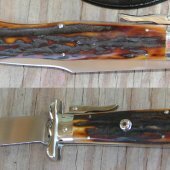 NOTE: These knives are marked REPRO on the back of the tang on the blade so there will never be any doubt they are not original. I do not fake knives. Do not ask me to do that, period. I hate thieves and when someone asks me to be one I don't take it lightly. These are our policies we adhere strictly to. Thanks an have a Blessed Day!